We can confirm the issue at our test site, so I am marking this as a bug and reporting to the developer. Hopefully, very soon the issue will be fixed. We appreciate your patience on this. I'm in the same boat we're freaking out that our customers can view this calendar. Client is reporting the same problem. Please advise! 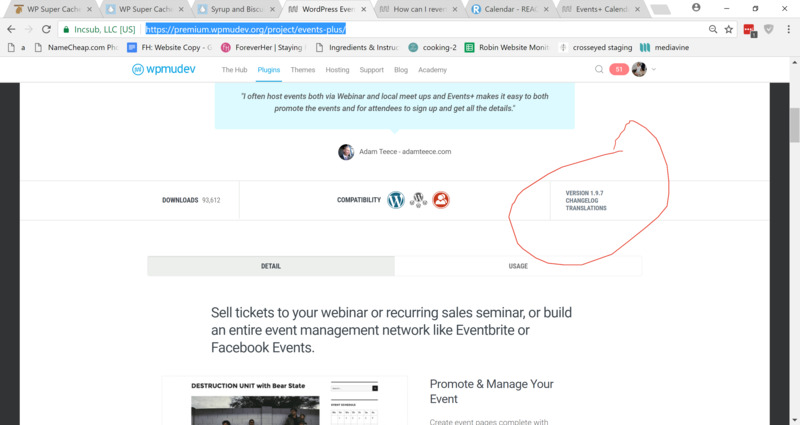 I've got a client site with the same problem of the calendar title for month showing "Nov 4400" and none of their events for the month are showing. Need help. I'm having the same issue with the calendar showing Nov 4400 and an upset client. Just so there would be a version of the calendar live on my client's site, I went to the plugin settings and changed the root slug to the calendar page. Liam Holding , Matt , sbahns, dmuchnok and Meagan I hope you guys are doing great today. We have looked into this issue and confirmed it was a bug in the code. I hope it also work for you as it works for me. Please note that this is not a final solution but I have submitted the fix to the senior developers and it should be included in the upcoming release but please confirm by checking the change logs before updating to new version. For now please replace the file 'class_eab_shortcodes.php` file in the 'lib' folder with the one in the attached zip and everything should work as expected. Please let us know if you have any further issues or concerns regarding this and we will always happy to help in any way possible. I followed the fix and the year changed but... now it's 1970. Help? I Had applied the fix and it worked temporarily. Now the date is showing Nov 1200. The has stopped working on my site as well. Need to fix ASAP! I would like to apologize for the inconvenience you're having! I've already informed our developers that the issue comes back, so they will provide new hotfix of new plugin version as soon as they can. Back in the same boat please keep me posted as a fix is available. The problem is obviously not being correctly fixed. Hey everyone, I have avoided the issue and went back to version 1.9.6 -- support helped me do it in a matter of minutes and none of my clients events were affected or lost. All of the trouble with 1.9.7 isn't worth the hassle when you can avoid it and go back to a stable version. Can you share the URL ? I hope you are all doing great, I am sorry for the inconveniences you are all having and hope to resolve this soon. With the one extracted from the zip file. I hope this works for you as it works for me but please let us know if it does not work and we will be happy to find another solution. This uses the same method as version 1.9.6 so it should be safe to update to version 1.9.7. Is anyone of you having the date issue anywhere else besides the Calendar shortcode? Any information will be very helpful for us to permanently solve this issue. Despite your obvious good intentions there have been a handful of "fixes" for this plugin and it is bad practice to issue another that you "hope" works. The plugin needs to be correctly stabilised and thoroughly tested or we are simply entering another round of fix, break, fix, break, fix, and that is not the WPMU way of doing things ! I took dmuchnok & joe's advice and reverted my client's site to 1.9.6 and it's all working great again. In addition to the calendar display being totally messed up, they also could not use the front-end event editor. They have been quite cross that the update caused so many problems with no fix coming out quickly. Reverting until a stable release comes out was the best thing to do and it should have occurred to me sooner. I hope you are all doing great today. I am sorry for all the inconveniences here. joe I understand what you mean and understand all your concerns. 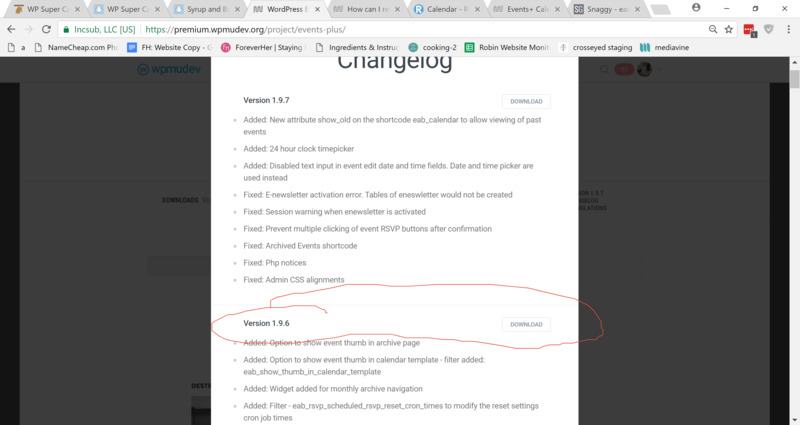 I have asked if there are any issues on the plugin besides the one reported here because I have compared the code for both version 1.9.6 and 1.9.7 for the Calendar Shortcode and verified that I ported the working code from 1.9.6 to 1.9.7 and provided it as my last fix. If this is the only issue then it should work after applying the fix because it works for the version you rolled back to. This is why I said it should be safe to update if this is the only issue you are experiencing. You can test on a staging/test site before moving to the live site. This is absolutely true. I assure you that is what we are doing after providing the fix we test it and see if it works before we release the update. Right now I have provided a fix so that you can continue to use the plugin while we prepare a permanent fix. In addition to the calendar display being totally messed up, they also could not use the front-end event editor. sbahns Thank you for the feedback. Could you please have a chat with Live Support about the Front End Editor, they will work with you and if it needs be they will open another support ticket for that specific issue. Thank you guys for all your patience, feedback and understanding - much appreciated. I hope we resolve this as soon as we can. Mahlamusa When the fix for this is officially pushed out in an update, is the version number going to change. I'm seeing the update to 1.9.7 in the dashboard, but should we be keeping an eye out for 1.9.7.1 - or something similar? Will you posting in this thread when the update is ready? I'm just wanting to know when it will be safe to run the update. Hello Mahlamusa, So it looks like version 1.9.8 has been released -- can you share on this thread if it addresses all of the issues that we have had & if we can now update safely? Thanks in advance! I hope you are doing great today. Thank you for the followup with regards to this issue. I have checked the change logs and on the Plugins page and it is indicated with this line 'Fixed: eab_calendar short code' I have verified on the code in my installation with version 1.9.8 that this issue has been fixed. With regards to the Front end editing module was able to test it on the default Twenty Seventeen theme and it seems to work well for me, even though I am not sure what the actual issue was but I have seen another thread where a related issue was being addressed but on that thread a Beta version of 1.9.8 was released. It seems those changes from the Beta are included in the current version. It would be helpful if you could test in a staging/development environment before update your actual websites. I hope this helps, please let us know if there are any issues and we will be more than willing to assist.